I think almost everyone is on holiday right now. But I simply want to wish everyone 'Merry Christmas & Happy New Year'. I want to thank all my blogger and flickr friends that have been always supporting me and encouraging me a lot with all your nice comments. I feel really blessed to have such nice friends like all of you. Forgive me for all of my mistakes and if there is any words that I didn't mean to perhaps bother you. Have a safe journey, Lia Chen. Hope you sis will walk out from the depression soon and wish the twin babies are healthy alway. Have a great Xmas and New Year! @Indonesia-Eats : Thanks a lot Pepy! Love love love your blog! Thanks for visiting my blog. I am so excited to seeing more of your recipes! Thank you Lia for your beautiful card and warm sentiments. You are a caring and thoughtful person, always with a happy comment to give, and I really appreciate that. I am happy to have met you through bento! I learn something from you every single day. I wish you and your family the best, and I hope everything comes out well with everyone. Merry Christmas and Happy New Year to you and yours!!! Good tidings to you and your sister. I hope the twins grow strong. And "no mommy rules" will be fun for awhile, but I bet your family will miss you a lot! God bless your sister and the twins! I'll pray for them too. Take care and have a save trip Lia Chen! Merry X-mas for you and all of you family, Lia! I hope the twins will grow healthy! Have a save trip and I hope you will have some fun over there, though! @Kids Dream Work : Thank you for your support in your prayer. GBU! @Amaaris : Thanks a lot Amaaris for your support too! You are so kind. I will have some fun there with my sister. Merry Christmas and have a lovely time in Melbourne! Take care! My family wishes you and yours the best! Thank you for your holiday thoughts and heartfelt greetings. Safe journey to you and your family, especially the little twins. Also, I really enjoy your bento blog as it's both beautiful and educational. I love learning from you. Hai, Lia.. I really-really hope the twins and your sister will bea healthy always. I have been in that situation like your sister, and I think it's a great decision that you go to accompany her. 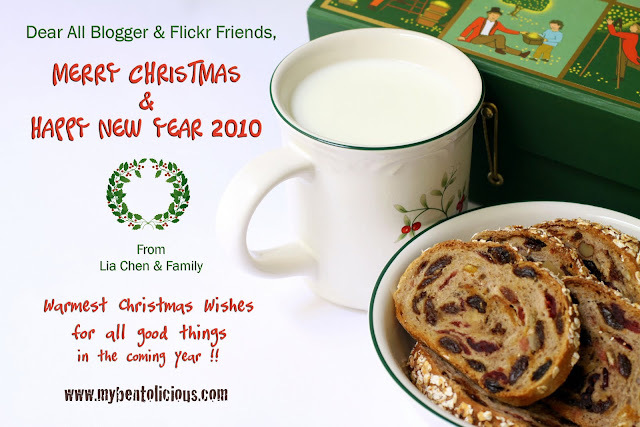 Merry X'mas and Happy new Year..
Wishing your sister and her newborn twins a speedy recovery! Have fun in Melbourne! Happy Holidays and Happy 2010! Hope the twins r fit to go home soon. Wish u and ur family all the best too, happy new year! i love your "e-card"! beautiful shot and set-up, as usual. wishing you a safe journey and sending your sister and the twins lots of good vibes and wishes. you're a sweet sister for helping out. happy new year to your whole family! @megan : Thanks a lot Megan for everything :) Thanks for being a good friend through 'bento world' ... Happy New Year too!! @Anncoo : Happy New Year too Anncoo!! You should be on your way to aussie, or perhaps already there. Hope everything will be alright with your dearest sister and the twins. May God bless your family! thanks Lia! Happy New Year! @debyyong : Thanks a lot Deby, really appreciate your kind words here. Have a happy new year too! Wish your sis and babies are health. sad to hear ur sister's story i hope everthing will be ok soon for them..